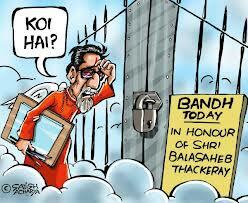 Just back from Mumbai, I left for Mumbai the day BalaSaheb passed away, being aware of the fact. My daughters were a bit worried. My coach Gopal was very confident that people respected Balasaheb too much to misbehave and the town would be peaceful. The bus driver refused to enter the city Mumbai, I mean our bus driver for all who log in and book their tickets on redbus this was a Kailabhairav transport, at 5.30 he drops us on the outskirts of Mumbai, none of the other passengers,even stand by us. we were six of us. Buses were plying, there were extra buses certain routes, I reached my scheduled stop with a suitcase a backpack and bedraggled form the night’s journey I started walking towards my sisters place,. A cop was standing by his bike. I asked him is there anyway I could get transport to my destination, “vaini, me soodale naa tumhala,” He actually dropped me to my sister’s doorstep. at 10 am I was back at Dadar for my session this time round I took the train, of course wisps of conversations drifted by discussing the man, his mission, the myth, the persona. Believe me, the town was subdued, but after my experience with MGR’s death hysteria, I was amazed by the decorum the Marati Maanos carried themselves. The day of the funeral I would have returned if the central railway was not overloaded, but next day I was back with no untoward experience except great respect for a man who command so much of love and respect without drama and hysteria, it was as if the average Mumbai Maharashtrian had lost someone from him immediate family. I learnt all through the conversations at the Busstop, in the bus and through Bhoiwada was people were on their way to pay respects to the departed soul. Many had stories of how the man and his actions had effected them. Some felt the loss of a powerful icon and leader who they looked up to who gave them a sense of dignity.